With U.S. military officialsfrustrated at the expense and time needed to build satellites, the Pentagon isfielding small satellites called TacSats that can be built faster and cheaperbased on already mature technology. At the sametime, the Pentagon is working to identify technology that is not ready today,but can be matured relatively quickly for use with TacSats at some point in thefuture. During abriefing for aerospace industry officials July 11, Navy Capt. Jeff Graham,deputy program officer for sensing and systems at the Office of Naval Research,summed up the frustrations of Navy space users--and their resulting interestin TacSats--with a slide that stated simply: "In general, 'space costs toomuch and takes too long.'" Defense officials want troops on theground to be able to use TacSats as soon as they need them to conduct surveillance of enemy troops, towatch for missile launches, track friendly forces, provide accuratetargeting and forecast weather conditions, Christopher Olmedo,the Army's liaison to the Air Force Research Laboratory, said during the July11 briefing, which was conducted at the Naval Research Laboratory's (NRL)Washington headquarters. The TacSatsare intended to be tasked directly by deployed military commanders. 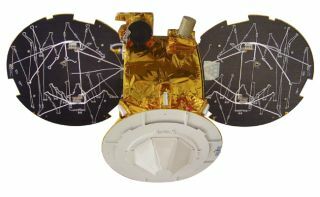 The firstspacecraft in the series is expected to launch aboard Space ExplorationTechnologies' Falcon 1 rocket in late 2006, according to the company's Web site. Separately,Congress added $17 million to the 2006 defense budget to begin a payload technologyincubator effort. That money does not expire until 2007, according to MikeHurley, head of spacecraft development and operationally responsive spaceat the NRL. NRL and the Massachusetts Institute of Technology's LincolnLaboratory of Lexington, Mass., execute the program on behalf of the Pentagon'sOffice of Force Transformation, which had started the TacSat work in 2003. NRL isleading work on both TacSat-1 and TacSat-4. Thetechnology incubator effort includes representatives from the Army, Navy andAir Force, Hurley said. The effort also coordinates with the various militarycombatant commanders to ensure that their needs are addressed, according to abroad agency announcement issued by NRL seeking industry proposals for workunder the technology incubator. Responsesto the broad agency announcement are due Aug. 14. The effort has three levelsof contracts, each with a different timeframe for awards. Basic workthat includes writing technical reports or testing a piece of hardware to seehow it might react to radiation in space could be covered under awards worth upto $500,000, Hurley said. Those awards are expected to be made by the end ofOctober. Awards ofup to $2.5 million that are part of a category called "moderate" could entaildeveloping relatively advanced payload designs, Hurley said. Those awards areexpected around December. The thirdcategory, dubbed "complex," includes awards of up to $5 million that could coverwork like the development of advanced prototypes, Hurley said. While that workwould not likely generate flight ready hardware, it could take the technologyto the point in maturity where it would be ready to be incorporated on a futureTacSat, he said. Theincubator effort is intended to focus on technology that is not likely to beaddressed elsewhere in the space community. One possible example of this istrying to apply payload technology used with unmanned aerial vehicles towards TacSats,as NRL did with TacSat-1, Hurley said. Whiletechnology used on unmanned aircraft might typically be excluded from a spaceeffort because it cannot survive over the long term in the space radiationenvironment, it might be useful with TacSats, which are notexpected to operate for more than a few years, Hurley said.